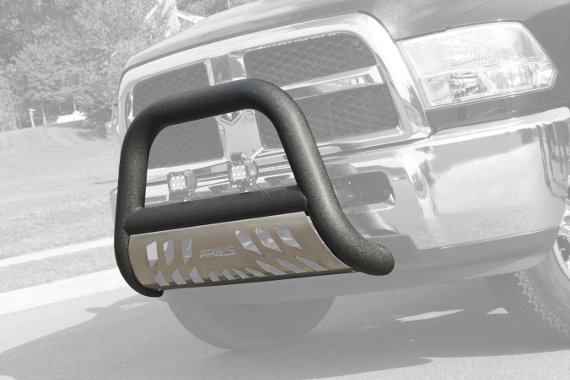 The ARIES line includes both bull bars and grille guards, including our patented AdvantEDGE® bull bar and Pro Series™ grille guard. When deciding which accessory to select for your vehicle, it is important to know some of the differences. A bull bar is generally designed with an A-shaped frame, consisting of a main outer tube and a center, horizontal tube or crossbar. The main tube extends up from the underside of the vehicle to cover a portion of the bumper and grille, depending on the model. Typically, a bull bar bolts onto the vehicle's frame and covers just the center portion of the vehicle's front end, as opposed to the headlights. Bull bars are mainly found on pickup trucks, Jeeps, SUVs and even crossover vehicles. Many come with a crossbar that can accept aftermarket lights, as well as a skid plate that attaches to the lower portion of the frame to deflect stones and other small road debris. 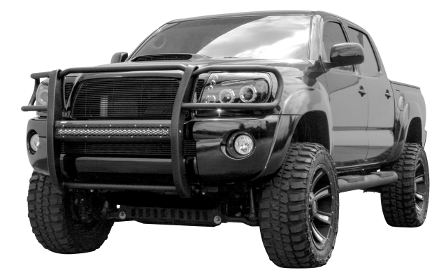 If bull bars have an A-shaped frame, grille guards could be said to have an H-shaped frame. A grille guard (sometimes referred to as a brush guard) is essentially made up of two vertical members, called risers, and a center, horizontal member, called a crossbar or center flange. The risers are usually equipped with mounting holes to attach the grille guard to the frame. Most grille guards also have a pair of side brush guards or rings attached to the risers that extend outward to protect the vehicle's headlights, as well as a top tube and bottom tube spanning between the risers. 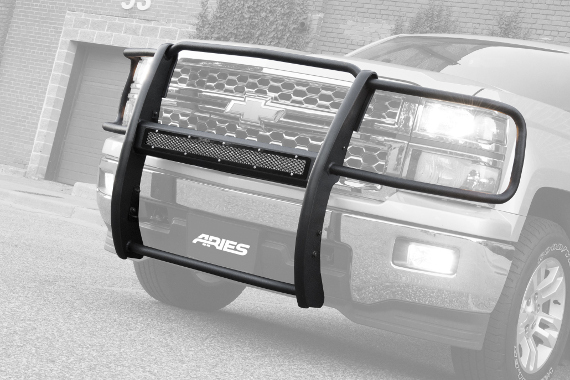 Like on a bull bar, the grille guard crossbar is typically designed to accept aftermarket lights, whether using pre-drilled holes or an LED light bar housing such as on the ARIES Pro Series™ grille guard.